Beamex focuses on making the work of a field calibration technician easier and more efficient by launching a global “Ready for the field?” campaign. 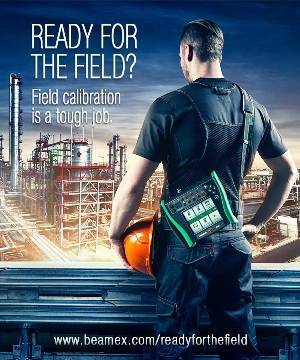 The campaign focuses on the challenging work of a field calibration technician and how the right gear can make that work much easier and also more efficient. Being a field calibration technician in the processing industry is a tough job: you are under constant pressure to be more effective, you need to have many skills and carry multiple devices, environmental conditions can be challenging and constantly changing, and the documentation of data takes time and is difficult in the field. Having the right gear makes the work much easier and also more efficient. Raimo Ahola, CEO of Beamex Group explains, “Out of more than 2,000 people who have responded to our studies on challenges in current calibration processes, every other person says he or she would like to carry less equipment in the field. According to the responses, this is by far the biggest challenge. Secondly, more than a third of the respondents state that documentation takes too much time and almost as many people stated that errors relating to documentation of data are too common”. The microsite beamex.com/readyforthefield explores the challenges related to the work of a field calibration technician and how the right gear and equipment make the work much easier and also more efficient.